On May 16, 1990, Sammy Davis Jr. succumbed to his battle with throat cancer at the age of 64. His health had continued to decline following his release from the Cedar-Sinai Medical Center earlier that year on March 13. His death is felt in Hollywood and in the African-American community where Davis is viewed as one of its greatest performers. His friendship with Dean Martin, Frank Sinatra and Jerry Lewis stood out in Hollywood during a time when integration was not permitted in many parts of the United States. The four friends known as the Rat Pack became legends on the Las Vegas strip. To the public, Davis is seen as pioneer for other young African-American performers seeking fame and fortune in the music industry. Davis remains firmly implanted in our minds with his performances of ‘Bo Jangles’ and acting roles on the silver screen. His final film performance in the late Gregory Hines’ ‘Tap’ is both nostalgic and sad for the deterioration in Davis’ physical condition can be seen in the film. As incredible as his performances were, the story of his life as told by Davis in this phenomenal autobiography is even more fascinating and key to understanding the many directions in which his life took him. Davis begins by recalling his childhood in which he started as an entertainer and the stormy relationship between his biological parents, both of whom were also entertainers and separated when he was young. His grandmother is enlisted to oversee his well-being but time and time again he goes on tour with Will Mastin, who serves as his second father at times. As World War II comes around, he enlists in the U.S. Army which at the time was infamous for racial prejudice and segregation. His memories of the treatment and lessons he learned in the service are both heartbreaking and eye-opening. Following the military he once again follows the show business path, the path on which he would travel for the rest of his life. Behind the scenes, his life became a rollercoaster ride. He lost an eye in a car accident, married May Britt in 1960 in the face of miscegenation laws, converted to Judaism and even carried a loaded gun on stage as he performed. He was a vocal supporter of the movement for civil rights, many of which he was denied himself throughout his life. His marriage to May Britt in 1960 caused both shock and outrage. The reactions of the press and even ordinary citizens is repulsive at times during the book but also critical to understanding the times in which Davis lived and how bold their actions were. Miscegenation was not struck down by the Supreme Court until 1967, and even then, interracial marriage was strongly discouraged and treated with hostility. 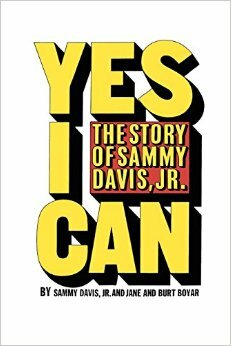 Davis’ ability to move forward in life and the struggles he faced within himself while married to Brit are key to seeing through to the real Sammy Davis, Jr. The book closes with the birth of his daughter Tracy. We now know that he was married several more times and had two additional children in his lifetime. When he died, he did not leave behind a mass of wealth as would be expected. But what he did leave behind is a legacy that continues to this day. If you want to know more about the real Sammy Davis, Jr., this is the place to start. Posted on July 15, 2015, in Biographies and tagged Sammy Davis Jr. Bookmark the permalink. Leave a comment.